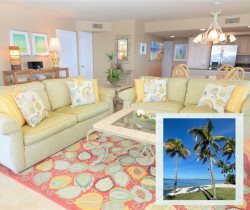 Featuring a large wrap-around, screened-in balcony and boasting amazing views of the Gulf, this unit at Sanibel Harbour is distinct from other vacation rentals near Sanibel Island. This spacious unit allows for the natural sunlight to come into the unit for most of the day. Many improvements made in the Fall of 2013: Completely renovated bathrooms, all new furniture in the living and dining area. HD flat screen TV’s throughout, new stainless steel appliances in the kitchen, new balcony furniture and many more great touches and amenities. King bed in master and one twin bed and one full bed in the guest bedroom, allowing for more sleeping accommodations. Sleeper Sofa. You may have found this rental on HomeAway 436382, HA ID 436382, VRBO 4363827ha, or Vacation Rentals 4363827. They were very helpful in managing the initial selection and acquisition of the condo I rented. Very professional and friendly. The place was great. Very well maintained and close to 2 beach areas without the hassles associated with staying in those congested areas. Private beach and pool was great. Marriott property was also very nice. I would stay here again and look forward to next year.